Ben was born and raised in Nome, Alaska. Growing up in Nome meant Ben and brother Russell learned to love and appreciate the great outdoors. Spare moments were filled with flying, fishing, dog mushing, skiing, and snowboarding. Ben is an Airline Transport rated pilot, as well as a Flight Instructor, and he flies for a living when he’s not guiding fishermen or skiers. He is proficient in fixed wing, rotor wing, ski and float flying, tailwheel and multi engine prop and jet aircraft. He not only has extensive knowledge of the Seward Peninsula from a birds-eye view, but has also traveled much of it in boats and on snowmobiles. Ben worked three summers for the Alaska Department of Fish and Game as a Fisheries Technician, primarily on salmon spawning projects. He is a certified Alaska freshwater fishing guide, first aid responder, rescue diver, and trained in avalanche avoidance and rescue. Adventurous by nature, he always has to know what’s around the next bend, whether it be a new place to fish or a first descent on skis. Ben enjoys exploring new territory and sharing flying, fishing, skiing, and his Alaskan backyard with others. Fred started guiding with Twin Peaks Adventures in 2006 after he retired from the Alaska Department of Fish and Game where he served the Sport Fish Division as Area Biologist in northwestern Alaska for most of his career. 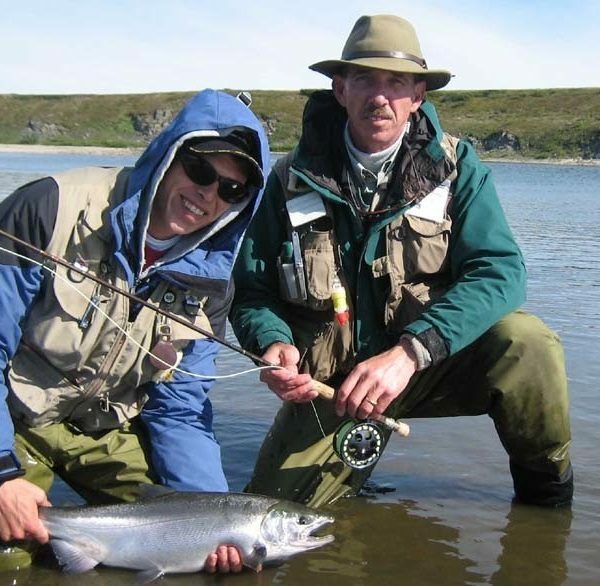 Fred has traveled extensively throughout much of western Alaska and has considerable knowledge of the resident and anadromous fishes of the area. As a fisheries biologist, he has conducted research on the life history and population dynamics of Dolly Varden, Arctic Grayling and other species over the past 25 years. Fred has fly fished throughout Alaska, in New Zealand, Western Australia, Mexico’s Yucatan, Christmas Island, Argentina and French Polynesia. Fred is a Certified Casting Instructor through the International Federation of Fly Fishers and will be available to assist beginning or experienced fly casters as needed. He is also a member of Trout Unlimited and the International Society of Arctic Char Fanatics. When not fly fishing, guiding, or casting, Fred can be found making custom knives at his home in Fairbanks. Steve began guiding with Twin Peaks Adventures in 2006. He attended high school in northern Vermont just 30 miles from the Canadian border. He completed the outward bound wilderness training program as part of the school curriculum and it was there that his love of the outdoors began. He was educated in wildlife biology at Arizona State University. Steve’s fishing began as a young boy in the streams, ponds and ocean throughout New England for smallmouth, trout, pickerel, pike, strippers and blues. After moving west for college he began fishing the Rocky Mountains and never looked back. Since that time his fishing exploits have taken him all over the continent from the flats and oceans of the Caribbean and Central America chasing bonefish, tarpon, snook, redfish, tuna, dorado (mahi mahi), and sailfish to the northern territories of Canada for pike and walleyes. But it was after his first visit to Alaska’s vast wilderness he was hooked and all he wanted to do was find a way to spend summers guiding anglers on their wilderness adventures. The wide open beauty and the unexplored streams and rivers of northwestern Alaska provided just such an opportunity. Currently when not in Alaska he works in Fort Collins, Colorado and in his spare time he is either small game hunting with his dogs in the central plains or working as a partner in a small guide service fishing rivers in northern Colorado and southwestern Wyoming. Originally from the east coast, Dave has lived in Fort Collins, Colorado since 1977 and has been working with Twin Peaks Adventures since the beginning. He float fishes several rivers in Colorado and Wyoming. Dave started fly fishing at the age of 11. He was lucky enough to grow up in an outdoor family and would regularly accompany his dad and brother on hunting and fly-fishing trips. He would regularly fish in and around Yellowstone Park alongside the late Charlie Brooks, where he honed many of the Fly Fishing skills he now shares with guests here in Nome. Dave is a private pilot and airplane owner and uses the plane to access many fishing spots where he has fly-fished for bass, pike, trout, tarpon, bonefish and dorado among others, and of course, dollies, grayling and salmon here in Alaska. Drawing on more than 50 years of flying fishing experience all over the US, Canada, Alaska and the Caribbean means Dave can adapt to many challenging conditions. He says that the Nome area is the best fishing he’s experienced in his lifetime. Peter, also known as Pedro around camp, has be honing his skills on Nome area fishing for the past ten years. Pedro started his passion for outdoor adventures in his teens on remote Canadian expeditions with his father and brothers. They would study the old topographical maps, pick a spot to get dropped off by bush plane, and be picked up at a new location weeks later. Pedro and family explored numerous rivers and lakes over many years, navigating only with a compass and maps. Later he majored in Fisheries Biology and lived at a remote freshwater research station while in college. Pedro has lived in Australia, England, and nearly a dozen states, including his present home on the Emerald Coast of Florida. In Montana, Pedro partnered with aquatic engineers on a very successful project to restore and enhance two spring creeks for improved trout habitat. Pedro and the engineers later worked together start Bridger Brewing, a well-respected craft brewery in Bozeman, MT. Pedro truly enjoys stalking the silver salmon up in Nome as well as the big, colorful dolly varden char. In the spring you can find Pedro chasing the grey ghost (steelhead) in the pacific northwest. At home in Florida you will find him out on his stand up paddleboard fly fishing for Redfish, Mahi Mahi, Speckled trout, and other marine fishes. He is active in Turtle Watch and Coastal Dune Lakes preservation. I can’t get Twin Peaks Adventures out of my thoughts. I still can’t believe we made the trip. When I was told it was an experience I would not forget, I never thought it would affect me this much. Thank you for the trip of a lifetime! ….I hope not, because I really hope to make this trip again.